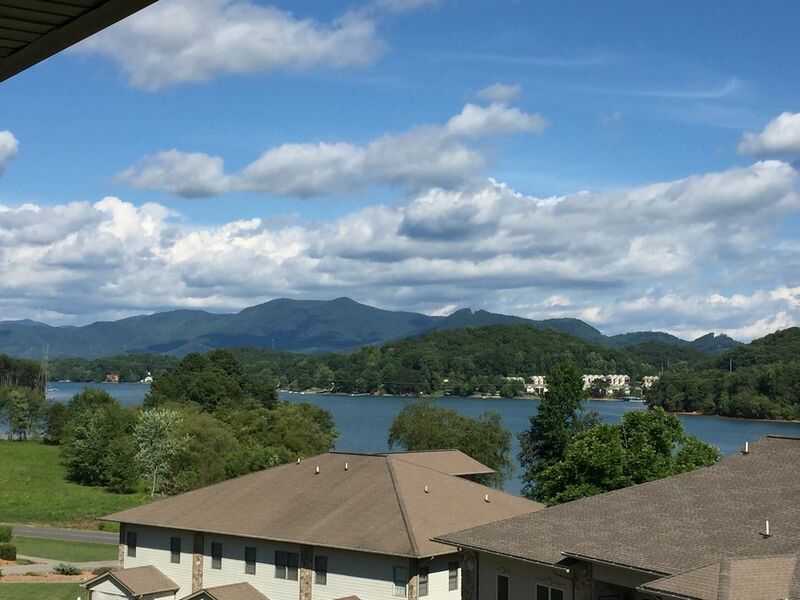 Luxury 3 Bed/3 Bath Condo W/panoramic Lake & Mountain Views (Up To 10 Adults). This condo has everything you need to enjoy your stay. The condo’s main level is located on the second floor of the building and is accessible by stairs or elevator making it handicap accessible. Enjoy the wonderful features of this newer built condo with hardwood floors, granite, luxury beds with 1800 thread count linens, and more. The main level has a fully functional kitchen with bar seating for 3 and table seating for 6. Also on the main level are a full sized washer/dryer, gas fireplace, TV-living area and outdoor deck. The main level has 2 bedrooms that can easily accommodate 6 guests, a king master suite and a guest bedroom with two full size beds. The upper level has a second king master suite that you have to see to appreciate (accommodating 2 additional guests). We like to call this upper level our “Honeymoon Suite” as it is equipped with a wet bar, poster bed and over sized deck with exceptional mountain and lake views. The unit is also equipped with a queen sized air mattress that can easily accommodate 2 additional guests and a pack-n-play for those with young children. Both king master suite bathrooms are equipped with jetted tubs and separate showers while the third bathroom has a standard tub/shower combination. There are many nearby activities from hiking, mountain biking, boating, tennis, golf and horseback riding. Staying active is easy here in the North Georgia Mountains. We recently moved to Georgia's greater Atlanta area from Minnesota to be closer to children and grandchildren. While we were already accustomed to metropolitan life and enjoy the many amenities they offer, we missed the great outdoors and lakes that Minnesota offered. While site seeing during the summer months of 2015 we fell in love with the Lake Chatuge area in NE Georgia. When we looked at this property we immediately fell in love with the breath taking views of the lake and mountains. (Unfortunately photos do not capture the full beauty of the scenery). We never get tired of relaxing on the upper deck just gazing at the picturesque scenery, whether it's day or night. The North Georgia Mountain area has several things to do for people of all interests. The surrounding area has many great restaurants to choose from if you just want to kick back and take a break from cooking. -easy to get in--coded access to door, no brokers to chase, no papers to sign, arrive when you want and enter immediately. -Easy online payment. -Second level entrance but an elevator makes the main level handicap accessible. -Covered third level over sized deck with exceptional mountain and lake views. -TV in every bedroom plus the Living Room. The Ridges Resort Marina is within walking distance and has boat rentals and slips available. Not to be used for pornographic or illegal activities. Violators will be prosecuted to the extent of the law. Dishwasher soap provided with property. Long term rentals plan to purchase or replace what you use. May include some condiments. Long term rentals plan to purchase or replace what you use. Limited supply. Long term rentals plan to purchase or replace what you use. Fully equipped dishes, utensils and pot and pans. Additional seating at the breakfast bar with three stools. Elevator to 2nd floor entrance. The main level has a king master suite and guest bedroom with two full sized bed. The main level also has two bathrooms, laundry area, kitchen, dining, TV-living room, Gas Fireplace and covered deck. There is an internal stairs to 3rd level second king master suite and over sized covered deck with exceptional mountain and lake views that is not wheelchair accessible. This rental property is your temporary home away from home. Please treat it with the same respect that you would your own property. Also please leave it in the same condition it was in when you entered so that others may enjoy the property and amenities. We had nine in our party and the place were at was extremely nice. . I would recommend this location to anyone. Thank you for the opportunity to stay here. We had a fun time celebrating Thanksgiving. It was especially nice to find an accessable rental since one family member coming for dinner was in a wheelchair. Beautiful property! Very clean, all working equipment, responsive owner and lovely scenery. Can’t wait to go again! Upon arrival we were all impressed from the beginning. The view of the mountains and lake was amazing. The accommodations were amazing. Every room was superb and the view from the balcony deck was a wonderful sight and a very peaceful setting. The location was convenient to many destinations in nearby towns with easy access immediate to the main road. We highly recommend this unit if you are considering a trip to the mountains. Nice condo, clean and comfortable. We spent a month here and are so glad we did. The condo was spacious and comfortable and perfect for us. Plenty of room when our family and friends came to visit. Excellent location - convenient to restaurants, shopping, water activities, golf, wineries, etc. We will definitely be back!